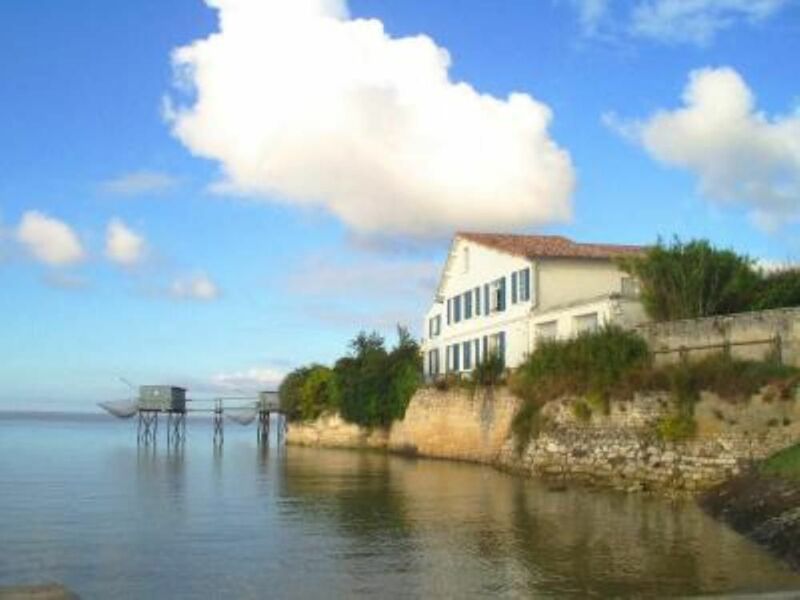 “The Old Customs House” has an unforgettable view overlooking the mouth of the Gironde into the Atlantic Ocean. This prominent 1930’s house is truly in an unforgettable magnificent panoramic position situated on the edge of the outstanding peninsula village of “Talmont sur Gironde”, classified as “One of France’s most beautiful villages”. You can watch and hear the tide rolling in and out from the kitchen, lounge, bedroom and of course outside on the balcony, terrace and in the garden. At high tide you are only meters away from the water. You really might feel as if you are on a ship on the sea. The house was built on the foundations of the former “Customs House”, therefore, giving title to its present name. For your holiday pleasure we have just finished renovating a 2 bedroom apartment on the 1st floor with splendid views overlooking the water .We have used only quality products to provide the comfort and style this magnificent house deserves. Inside you will find a large comfortable living room, fully equipped beautiful built in kitchen-dinning room, 2 double bedrooms, each with their own bathroom or shower room and separate WC, separate laundry room, as well as 2 separate entries on to the terrace and then down to the walled in garden, which is shared with us. French and English TV and DVD Player. There is private parking. The apartment provides the perfect view for JUST watching. There are many species of wildlife who visit the nature reserve of the white cliffs and the bay just outside the windows and balcony. This is quite simply one of the most beautiful holiday locations you will ever find. The accommodation is fabulous. The attention to detail is excellent...you’ll want for nothing. We have now stayed at the Old Custom House twice and have already booked for 2019. It is a peaceful property with a lovely garden and an unparalleled view of the Gironde estuary and the local fishing boat. Nothing is too much trouble for Valerie and John and they are very welcoming hosts. As I walked into the large and well appointed kitchen,diner I felt as if I had come home. Merci beaucoup!! It was a pleasure! Très beau cadre .maison tres fonctionnelle et agréable. Talmont is 16 km south east of Royan, 10 km south east of the gorgeous white beaches of St Georges de Didonne and just minutes away from the fine sandy coves of Meshers. The famous wines of the Medoc are just across the estuary. It is a fun day out crossing by boat from Blaye or Royan, to the Medoc to visit the castles and their wine caves. You can also drive to Bordeaux (1-1/2 hour away). On the Atlantic Medoc coast you find the large dunes and waves of the Bay of Biscay. On the north side of Royan you have the “savage coast” with its forests and natural beaches. There you will find one of the finest zoos in Europe “La Palmyre”. Rochefort is 1 hour from Talmont and La Rochelle (with its airport connecting the UK and France) is 1 ½ hours north. The ancient roman town of Saintes (25 min drive) has been labelled as a “city of art and history” by the minister of culture. We are just a walk away from the archaeological ruins of what is believed to have been the largest Roman port of France during the Roman empire. Here you will all find a truly enjoyable vacation experience!! Talmont’s streets are lined with holly hocks and flowers. There are lovely artist’s shops in the village and several restaurants from which to choose. You will want to have a nosy around more than once!!! Hikers will enjoy the endless walking paths of the area. The pilgrim’s way also passes along this coast line. The village was originally founded by Edward I of England in 1284. The stunning church of St Ragegonde has the typical roman saintonage style dating back to the 12th century. St Ragegonde is sitting on the edge of the cliff surrounded by the sea on one side and has its ancient marine cemetery covered with holly hocks on the other. Talmont has its own local history museum and tourist information center. English guided tours are available. The countryside outside Talmont is filled with Charentaise vineyards whose wines are really starting to make a name for themselves. The regional food specialties are seafood, shellfish, oysters, goat’s cheese, various duck & pork pâtés and Charentaise melons. The nearest farmers markets are in Meshers, (everyday except Mondays in the summer) St George de Didonne, Cozes (Wednesdays) and Royan (except Mondays). The bakery in Arces, 4km away has an excellent selection of breads, pastry and pizza as well as a small shop for necessities. Meshers, 5 kms away, has all your local amenities, bakers, doctors. nurses, pharmacy, large grocery store, etc. In summer, the bakery truck visits Talmont every day and will take special orders. Off the shores are also the typical regional fishing huts called “carelets” which add their own special charm.